The new 13-inch MacBook Pro with Retina display is said to be identified as model "J44a," according to French website MacG, which cited "confirmation" from a reliable source. The new 15-inch model is said to be identified as "J45a." 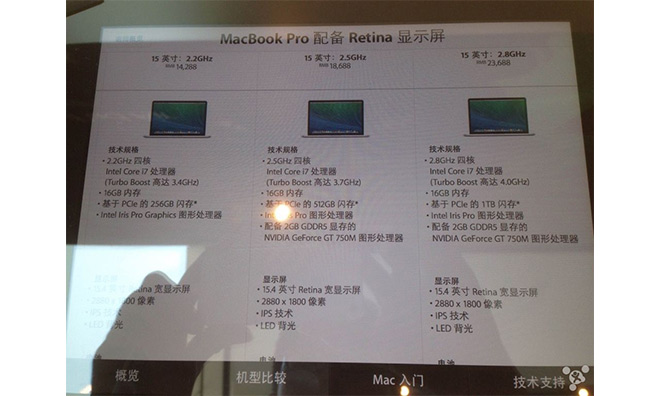 No other information on the new high-end MacBook Pro models was provided, though alleged in-store signage from China leaked on Sunday claiming to show the new 15-inch models will see slight CPU speed increases and will come with 16-gigabytes of RAM in all models. The alleged advertisement also seemed to suggest that the models would come at the same price points as the current offerings. If true, that would fit in line with Apple's other Mac upgrades thus far this year, which have seen minor improvements in light of no major chip upgrades available from Intel. The hold-up is in Intel's next-generation chips, dubbed "Broadwell," which have seen numerous delays. Intel has promised that the first Broadwell CPUs will hit the market before the end of the year, but it's unknown whether they would arrive in time, or in significant enough capacity, to power any new Macs. In June, Apple launched a new $1,099 iMac, reaching a new price point with a low-end processor. Apple also dropped the price of its MacBook Air range in April, reaching a new entry price of $899 and increasing the speed of its processors by 100 megahertz. Apple is expected to debut a new 12-inch MacBook model later this year with a Retina display. Speculation has suggested that this model might be a redesigned MacBook Air and the first to feature a pixel-packing screen, while some believe that Apple might be waiting for Intel's Broadwell CPUs to launch the rumored new model. The 12-inch Retina MacBook Air is also rumored to sport a fan-less design, which would require cooler and more efficient CPUs. Apple is also expected to achieve an exceptionally thin design with a new click-less trackpad and fewer inputs and outputs.